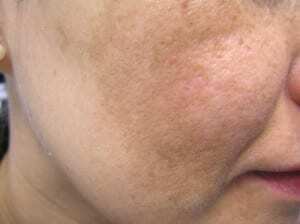 Melasma is characterized by a patchy brown or dark discoloration of the skin that occurs on the face. It is most commonly seen on the cheeks, forehead, nose, or upper lip. It occurs in women, typically due to hormonal influences such as birth control pills and in women taking hormone replacement therapy. It is very common during or after pregnancy. Melasma is felt to be related to the interaction of hormones with sun exposure. Melasma can be a challenge to treat, but avoiding the sun and judicious use of sunscreens is helpful. Prescription treatment options may include topical creams such as tretinoin, hydroquinone, and other acids. Other effective treatments include chemical peels and laser treatments.